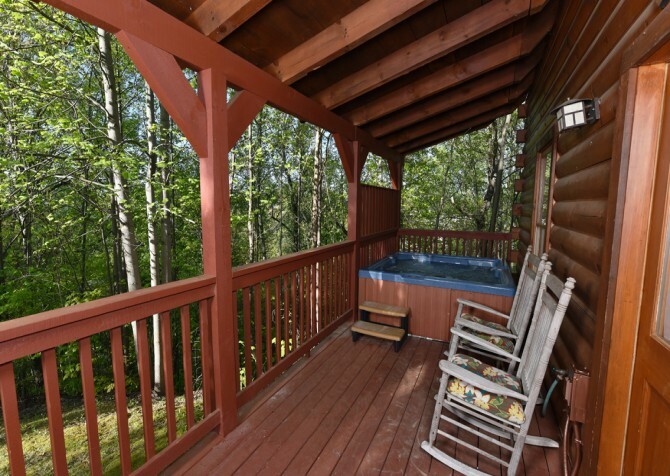 Dreaming of nights by the wood-burning fireplace, afternoons unwinding in front of the big screen TV, family meals with wooded views, and soothing soaks in your own outdoor hot tub? Slip away to Almost Home, a dreamy 1 bedroom + loft, 2-bathroom cabin for 6 in the Shagbark community of the Great Smoky Mountains! 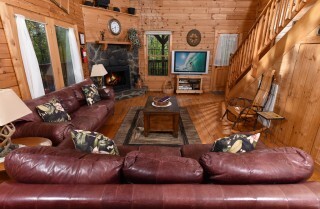 This Pigeon Forge cabin offers classic mountain style and modern amenities, making you feel at home and swept away all at once. Sway with a good book on the porch swing, whip up homemade meals in the fully equipped kitchen, show your bestie who’s boss at pool, and relax with a spa bath in the master suite’s jetted tub before dozing off in the king-size bed. Whether you’re on a family vacation or a trip with friends, Almost Home provides ample space with extra amenities — sure to keep everyone entertained in the Smokies! Drop your suitcases at the door and sprawl out in the welcoming living room — featuring sky-high ceilings, tons of natural light, and cozy furnishings. 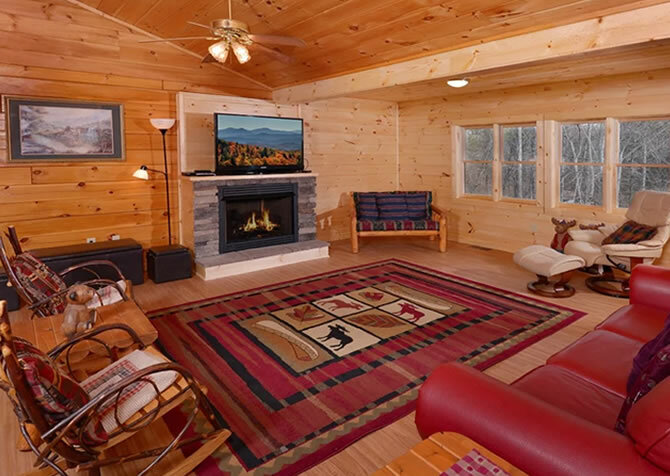 Feel free to rest on the plump sofas while the little ones explore the area rug or relax in the beautiful rocking chair, crafted with a touch of nature. With a stone-bordered, wood-burning fireplace as the focal point of the room, cool evenings won’t come fast enough. 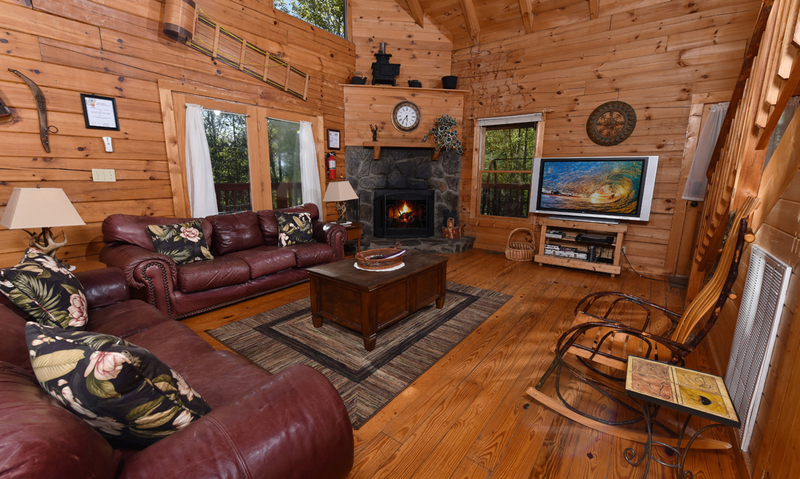 When nighttime settles in, pile snacks and drinks on the coffee table and pop in your favorite DVD for movie night on the big screen TV. One of the sofas even unfolds into a queen sleeper, so you can tuck the kids in before the show begins…just in case. 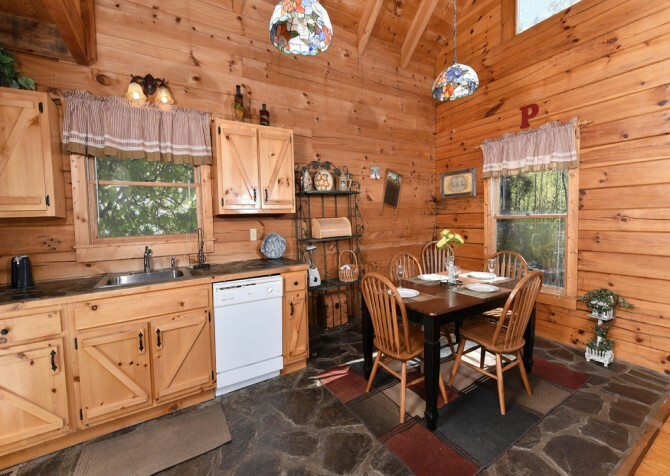 With an open floorplan throughout the home, the kitchen is mere steps away from the living room, making it easy to keep an eye on the kids and your favorite TV drama. Grab popcorn refills in a flash and prepare meals with ease in this fully equipped space, featuring stone flooring, handy appliances, cookware, silverware, mugs, and more! Scramble eggs and fry bacon on the stove, brew endless pots of joe with the coffeemaker, brown bagels in the toaster, create healthy fruit smoothies in the blender, toss a Greek salad with fresh ingredients from the fridge, bake a cheesy lasagna in the oven, and wash little hands in the stainless-steel sink. 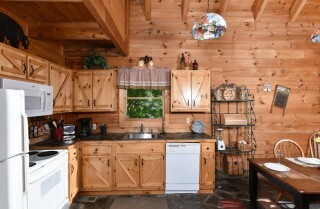 Plus, there’s a dishwasher ready and willing to clean up any mess you can muster! 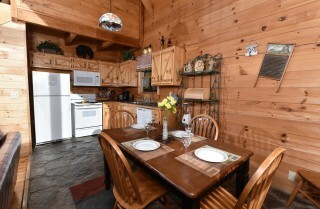 Having a dining space to gather the group is always a nice touch to a Smoky Mountain vacation. 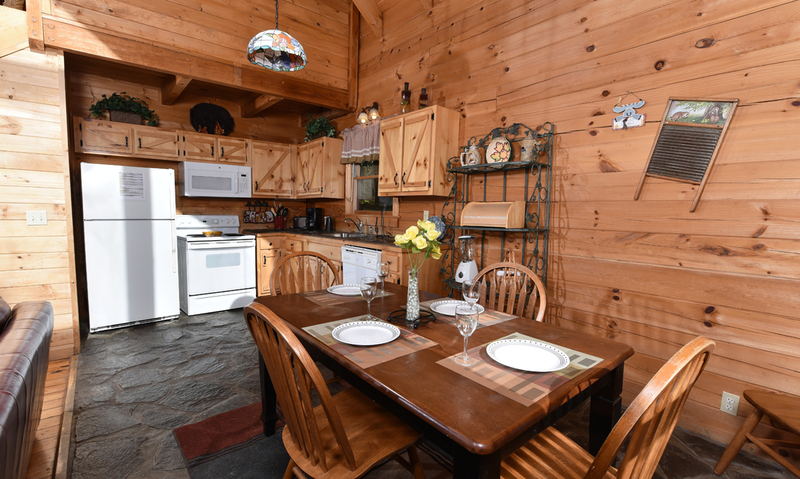 Reconnect with family and friends as you dine on homemade meals, restaurant leftovers, delivered pizzas, and midnight snacks at the wooden table for 4 (with an extra seat in the corner). When everyone is finished, clear the table and bust out a board game from home or tackle one of the provided puzzles. Remember, it’s not about the food or the activity but about spending quality time with loved ones. 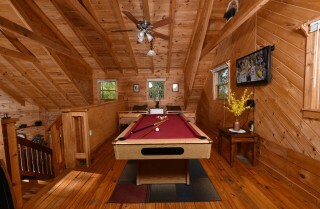 After all the food has settled and the laughter dies down, head to the loft for a few rousing rounds of pool. 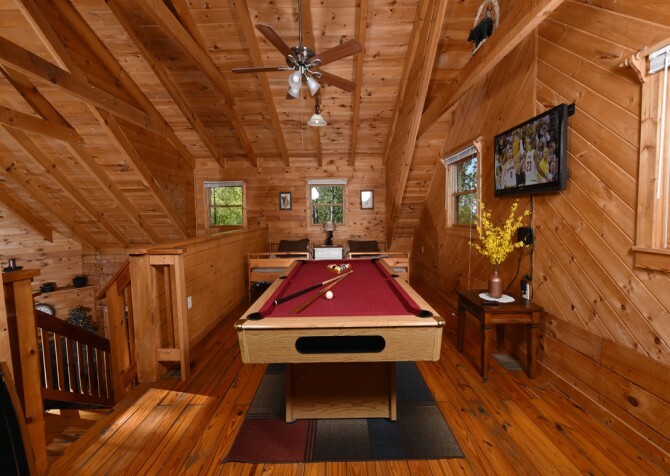 Turn on the mounted flatscreen TV to keep up with the latest sports match or hit up a party music station and groove to the beat while you await your next turn. 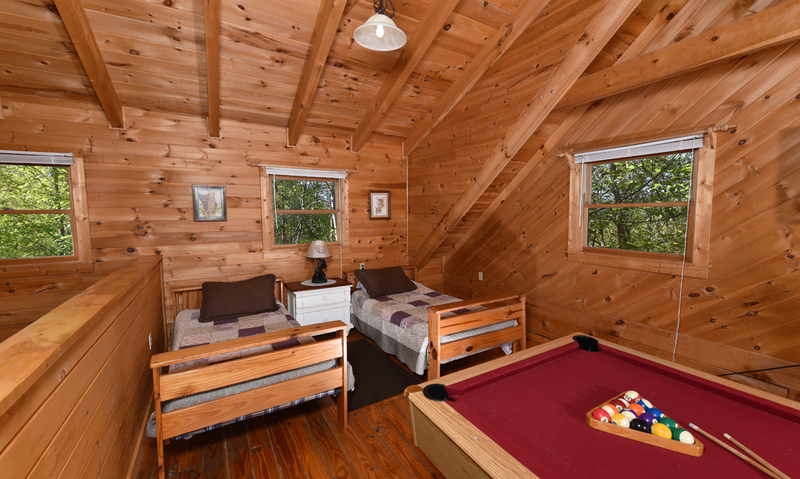 With 2 twin beds in the space, you can leave the teens to play and pass out as you head to the master suite for some downtime. 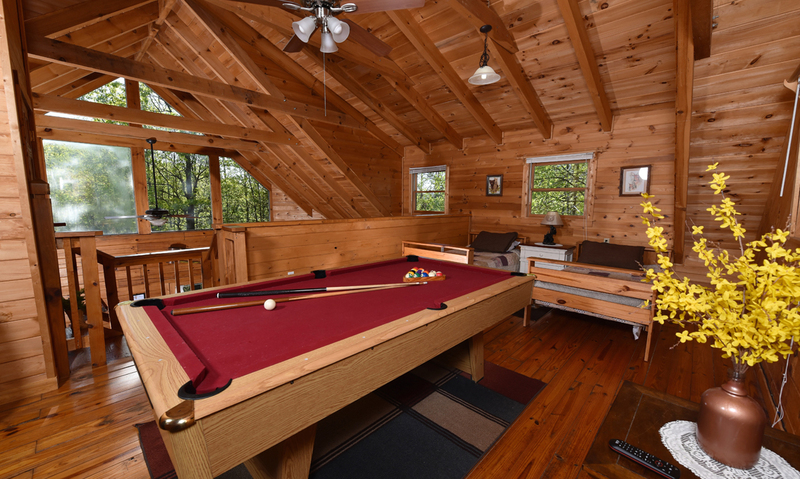 Oh, and don’t forget to follow the cabin rules: relax, enjoy, play, and don’t feed the bears…even if they do win the pool match! 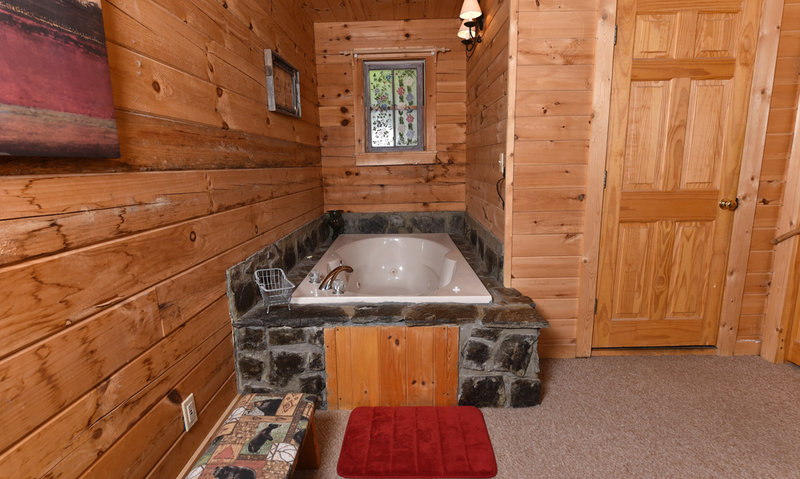 Ah, the master suite…where you can go for a bit of privacy and well-deserved rest and begin every evening with a rose-scented bubble bath in the jetted tub surrounded by stone. Worried you’ll forget your favorite bath bombs, lotions, or candles? Order the Just for Her basket, which comes not only with spa bath essentials — such as bath salts, bubble bath, an aromatherapy candle, and a bath pillow — but also a book of poetry, bath tea, soap petals, a massager, and more for a relaxing time night after night! 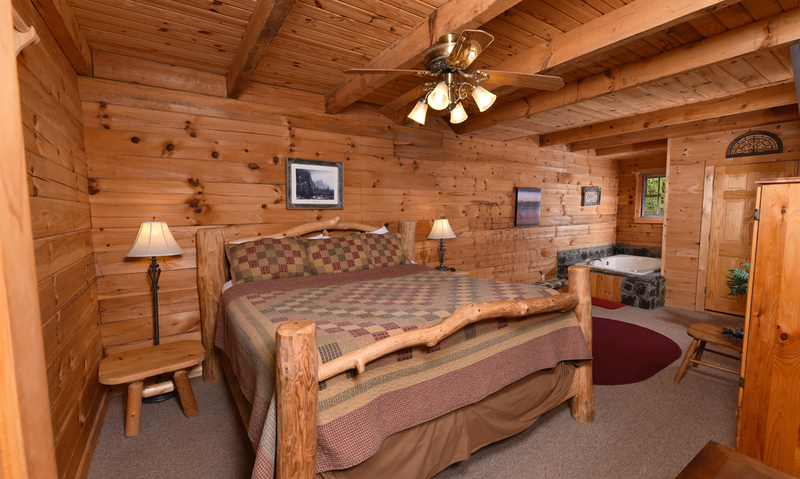 Once your muscles are warm and your mind is at ease, slip into the cool sheets of the king-size bed and watch a romantic comedy on the mounted flatscreen TV before drifting to sleep. 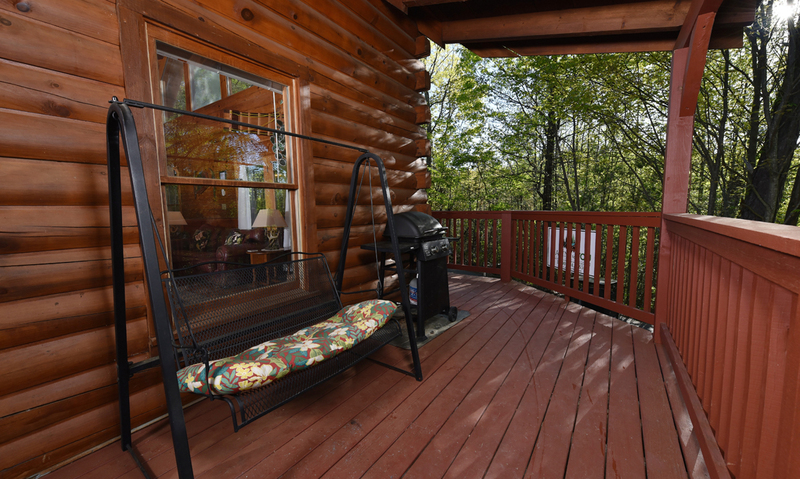 Step onto the spacious deck for outdoor fun and relaxation! Unwind in the mornings with a cup of green tea and a sway on the porch swing or a turn in the cushioned rocking chairs as the birds begin their sunrise melodies. As lunchtime approaches, cook beefy burgers or veggie kabobs on the gas grill for a Smoky Mountain barbecue party. The cabin even provides propane for your grill, so you don't have to worry about picking any up! On cool evenings, change into your swimsuit for a calming soak in the outdoor hot tub. 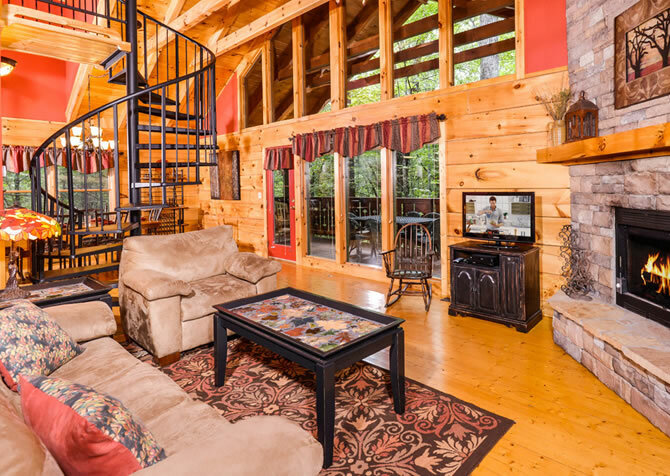 With tree-studded views all around, peace and tranquility are only a glance away. Plus, this home boasts a seasonal mountain view, best captured in winter. 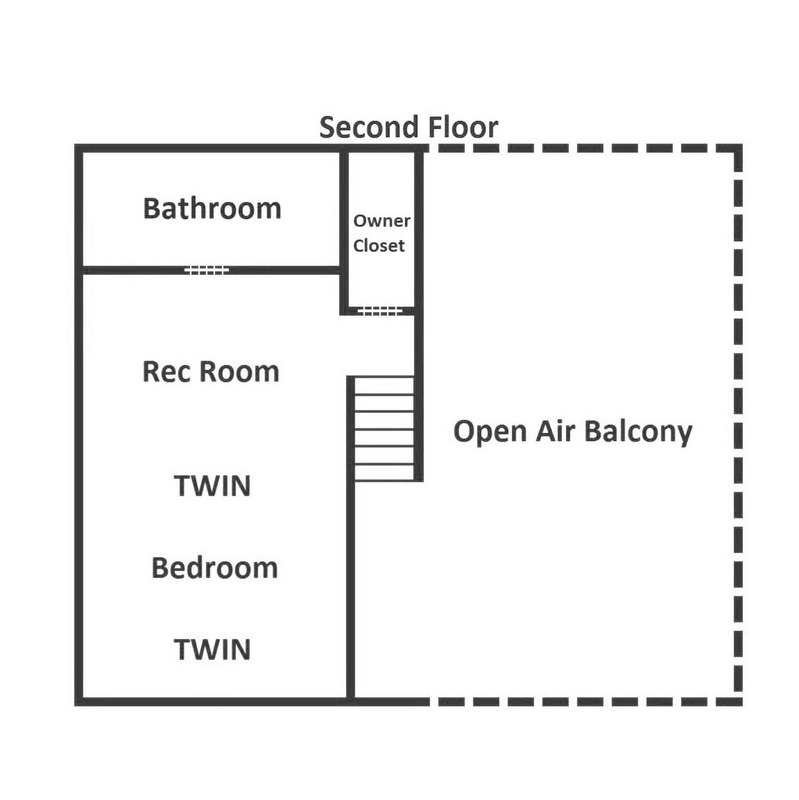 Featuring a paved driveway with parking for 2 at the top and a spot for 1 at the bottom of the steep hill, Almost Home has plenty of space for multiple vehicles. 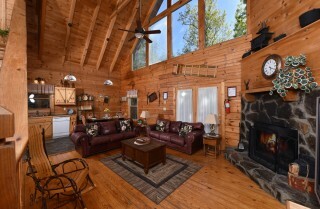 And with only 6 steps into the cabin, unloading the cars will be that much easier. 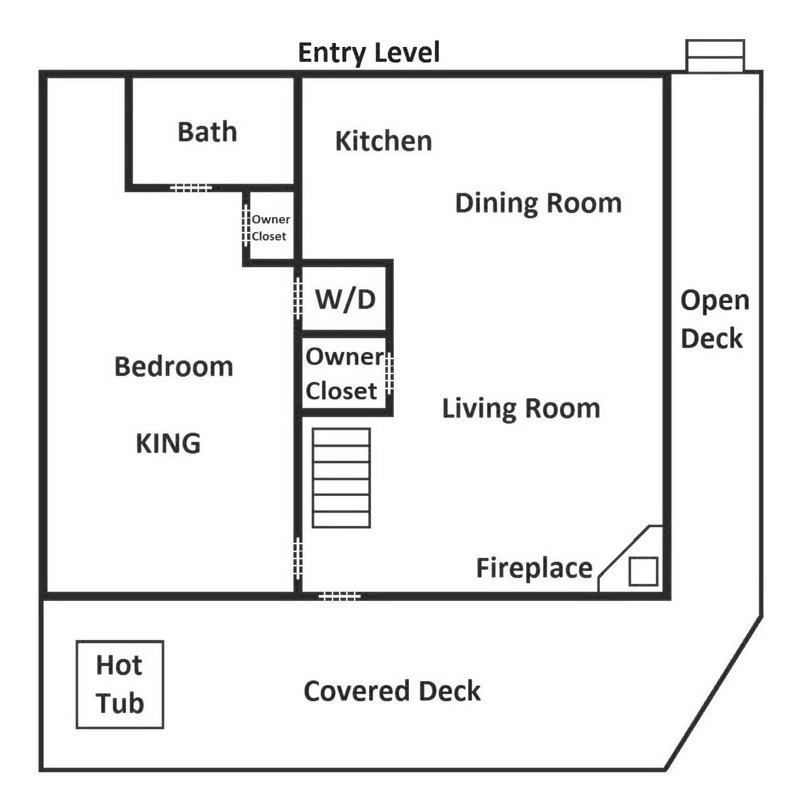 Don’t want to miss the conveniences of home? 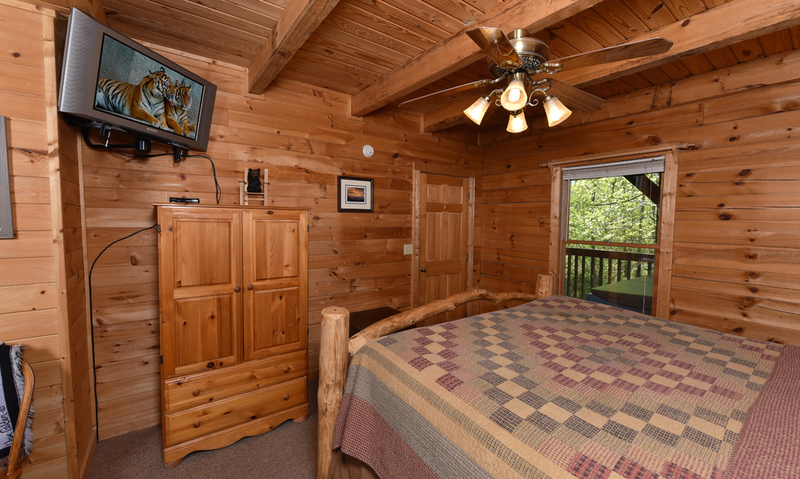 Almost Home has you covered — with complimentary high-speed internet and a stackable washer and dryer! Easily find local deals online and wash clothes and towels at your convenience. Located in the Shagbark community, this cabin also provides FREE access to the community pool as well as the tennis courts and basketball goal. 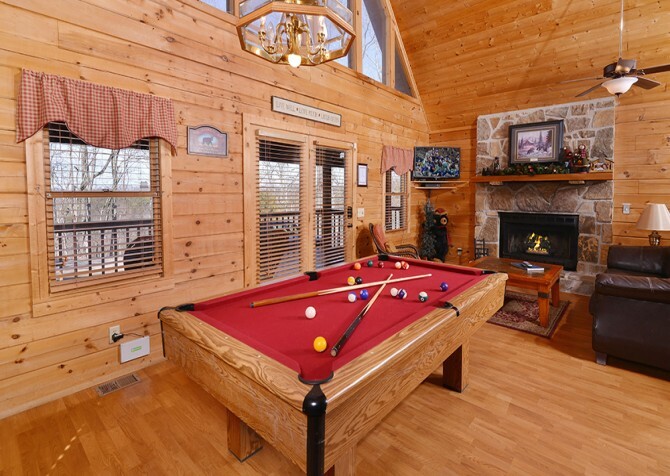 There’s just no end to the entertaining amenities that come with a leisurely stay at Almost Home. 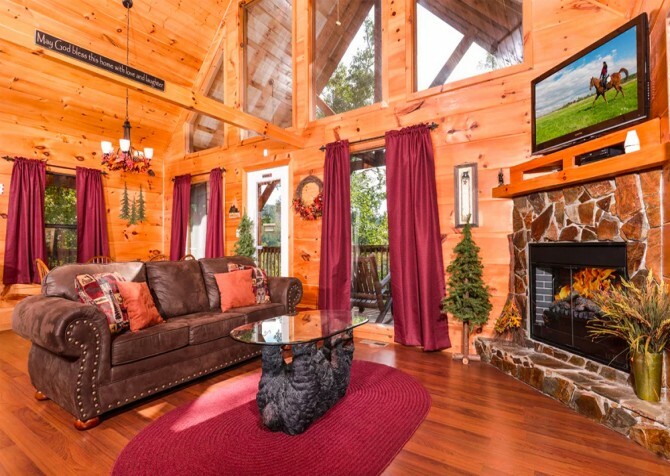 If you can bear to leave Almost Home, head to the heart of Pigeon Forge for fun attractions, tasty restaurants, endless shopping, and outdoor activities! Grab a few Smoky Mountain souvenirs for your home, pick up homemade fudge for coworkers, and stop for a savory snack or a mouthwatering meal at Moonshine Ridge Country Store & Café. 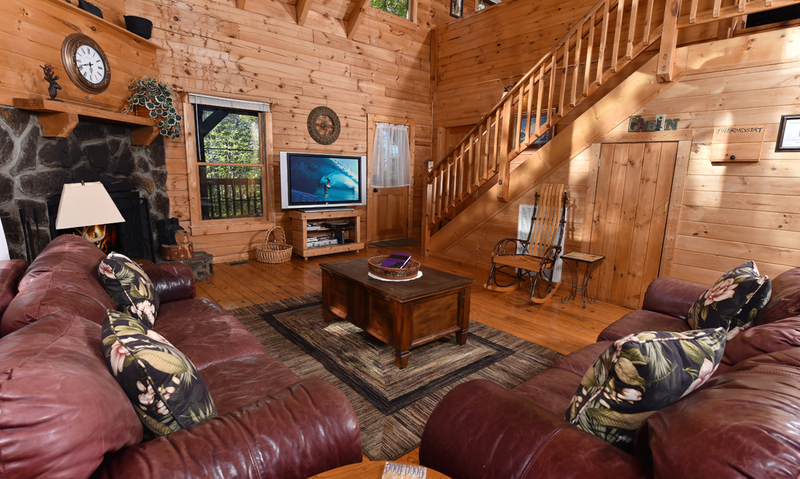 Zip over 7,500 feet of line up to 250 feet high at Wears Valley Zipline Adventures, featuring incredible views of Mount LeConte and the Great Smoky Mountains National Park. Soar up to 27 miles per hour through the forest trees on the Smoky Mountain Alpine Coaster — self-proclaimed the longest downhill ride in the nation! "It was a pleasant stay with awesome cabin and utilities but there was no scenic views around the cabin"
Thank you so much for taking time to leave us a review! We are happy to know you enjoyed your stay at Almost Home, and that you thought it was awesome. 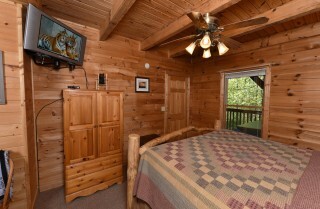 The Smoky Mountains are a special place and we are glad that you chose Cabins for YOU for your stay! "Highly recommend using Cabins for You, very friendly helpful staff! 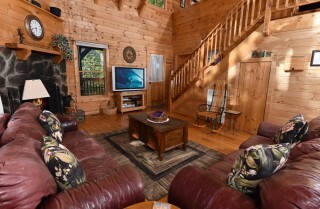 My family stayed in the Almost Home cabin in Pigeon Forge, Tennessee. Everything was even better than expected, and it was an all around amazing trip. We will definitely be going through them again next year!"